Pubblicato postumo nel 1987 (gli Smiths erano gi� sciolti all'epoca), "Strangeways, Here We Come" � un album in qualche modo incompleto. Suggerisce vette elevatissime senza mai raggiungerle del tutto. Strangeways � una prigione a Nord di Manchester ed il titolo sembra essere un gioco di parole su "Borstal, here we come" tratto dal film del 1963 "Billy Liar". 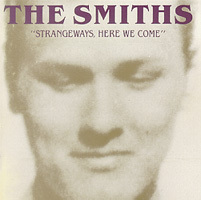 Released posthumously in 1987, Strangeways, Here We Come was a somewhat incomplete album; it hinted at great heights, but never quite achieved them. Strangeways is a prison in North Manchester, and the title is a play on "Borstal, here we come" from Billy Liar.